Whilst working with a SharePoint 2013 environment I experienced slow page load times and poor search performance. After initial page loads performance was fine for several minutes before the performance issue returned. The fix for the problem is to export the SharePoint Root Authority certificate using PowerShell and import it into the Trusted Root Certificate store. Open the SharePoint 2013 Management Shell as an administrator. 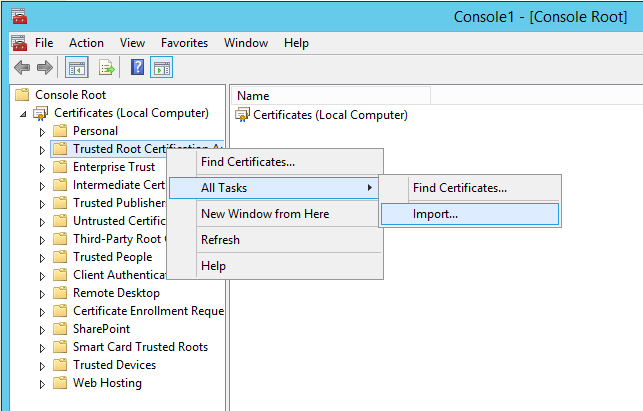 Open the Certificates MMC by opening a Run command and type MMC. Choose File -> Add/Remove Snap-in. 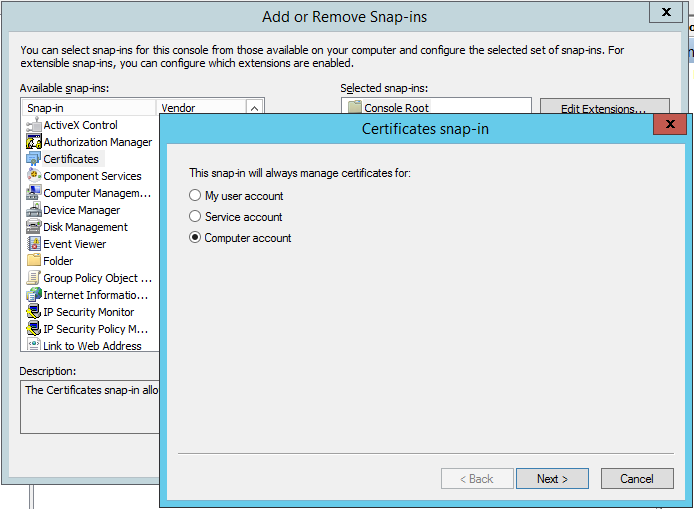 Select the Certificates Snap-in and click Add. On the next screen select Computer account and click Next followed by Local computer and Ok. Complete the wizard by loading the certificate you exported using PowerShell. Repeat the process on all SharePoint servers experiencing the issue. These steps fixed the error on most of our SharePoint servers, but it remained on two. In order to fix the error on the two remaining servers I configured proxy access through Internet Explorer, then from an elevated command prompt ran “netsh winhttp import proxy source=ie” This configures Windows to use the IE proxy configuration as a default. The servers were then able to access the internet and verify the certificates. This entry was posted in SharePoint and tagged performance issue, search performance, SharePoint, SharePoint 2013, SharePoint Root Authority certificate, Trusted Root Certificate on July 2, 2014 by richardstk. Thank you more than you can imagine. I have seen partial solutions for this issue all over the web – but none have explained the problem nor covered the steps as well. Hi handy post. I have been working on a SharePoint 2016 farm in which I fixed a few issues incl people search and oddly a few more issues seem to have appeared including the one resolved by this post. In my case it appears only on one WFE so I haven’t touched the other servers.